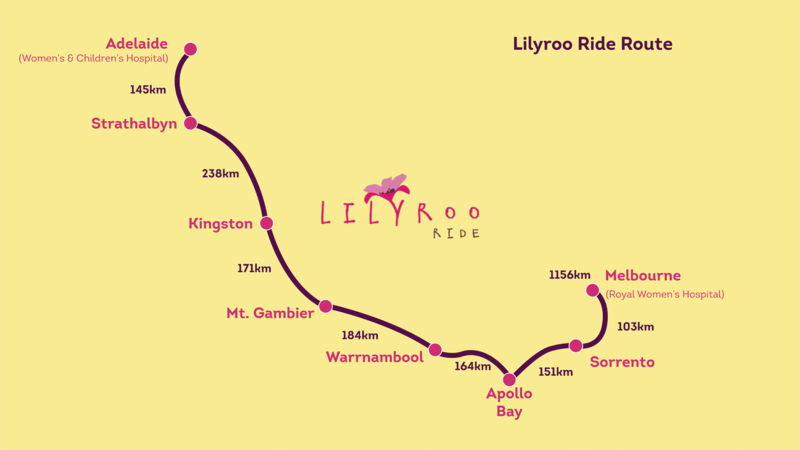 The inaugural Lilyroo Ride is a 1156km 7-day charity bicycle tour from Women’s and Children’s Hospital, Adelaide to the Royal Women’s Hospital, Melbourne. The tour will take place from Sunday 5th April 2015 to Saturday 11th April 2015 and raise much needed funds for the Royal Women’s Hospital NISC unit. The ride will navigate the coastline along the south of Australia between Adelaide and Melbourne travelling through McLaren Vale, Coorong National Park, the Great Ocean Road and Mornington Peninsula. Celebrate the life of Lily Mary Lockyer and create a positive legacy. Raise in excess of $200,000 in donations from the 30 riders, Sponsors and the Public for the Lilyroo Fund for the Royal Women’s Hospital Newborn Intensive and Special Care (NISC) unit. Educate the community about the activities and personnel of the NISC unit of the Royal Women’s Hospital (based in Melbourne, Australia), primarily as they relate to issues surrounding premature childbirth. Create a platform for an annual sport-based fundraising event for the Lilyroo Fund with staying power to continue over time.